Gifts for Her | Flowers for her Delivery Auckland N.Z. Thanks very much for the wonderful flowers, very nicely presented…. really made my wife’s day. Gift Ideas for Her - FREE Delivery Auckland. Perfect gifts for your favourite women - whether you need a present for a girlfriend, your Wife, Sister, a gift for your best friend, or even for your Mum. This is our unique take on special flowers and gifts that will make a wonderful lady smile all day. 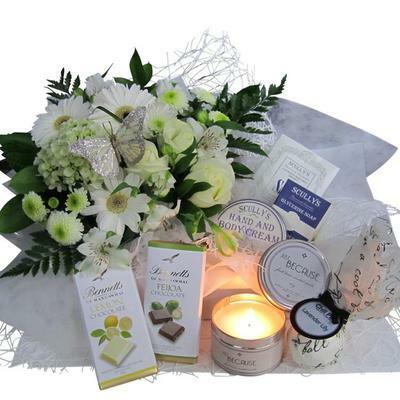 For a special birthday present choose from Pamper packs, pretty gift baskets, lovely bouquets of fresh seasonal flowers, to stunning Phalaenopsis Orchid Plans (moth orchids). If you need to get it delivered today to a work address please order by 9.30am so we can ensure we get it to her on time! We have a range of Pampering Bath and Body gift sets - a perfect gift for a girlfriend, feminine gift baskets for her, or spoil her with chocolate gift baskets, or perhaps a more healthy gift of fruit and flowers. We also have a range of beautiful gifts to add on to your flowers including: candles, oil burners, vases, luxury soaps and body creams, and of course delicious N.Z. made chocolates. Please call us direct on 09 838 9058 if you would like us to make up something special that she will love. We deliver flowers and gifts all over Auckland.